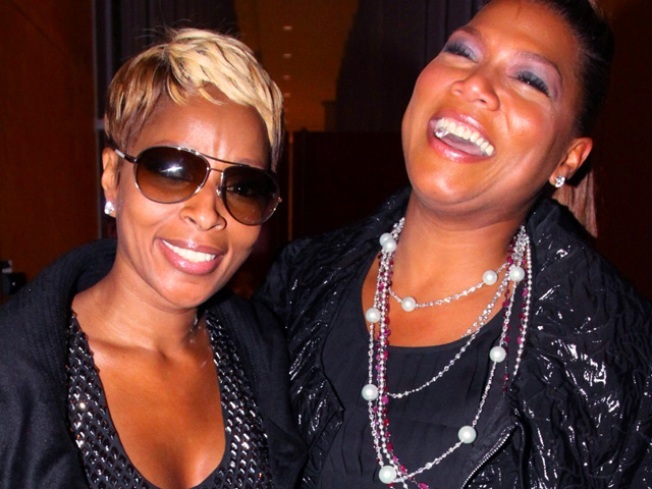 Mary J. Blige and Queen Latifah attend the 4th annual Black Girls Rock! awards at The New York Times Center on October 17, 2009 in New York City. If there was, for some reason, any doubt that African-American women can rip it, the Black Girls Rock Awards 2009 sought to decisively quell any naysayers. The fourth annual award show is the fundraising event for the Black Girls Rock organization founded by celebrity DJ Beverly Bond. Held at the New York Times Center and hosted by actresses Regina King and Tracee Ellis Ross, the event honored ladies who have represented in Hip-Hop, Hollywood and beyond. Despite the title, the show wasn't a bunch of chicks with Afros head-banging. The event lauded the achievements of a diverse set of women and one rockin' black guy, singer Anthony Hamilton, who snagged the “Soul Brother #1” award. White House fellow and AIDS activist Dr. Mehret Mandefro took home the “Community Outreach” award for her international public health work. The leggy Naomi Campbell swished in to accept her “Fashionista” award and insist that women of color be represented “correctly” in fashion. Motivational speaker Iyanla Vanzant accepted her “Shot-Caller” award with a succinct but compelling anecdote about her rise from a pregnant teen subsisting on welfare to a New York Times best-selling author. At just 23 years young and armed with an insane list of accomplishments, Raven Symoné scored a “Young, Gifted and Black” award. Yet, she kept it real with a speech centered on her giddiness about turning 24 and staying positive despite the madness of showbiz. Poet and “Living Legend” honoree Sonia Sanchez delivered one of the night's most memorable moments with an animated speech peppered with slam poetry idioms and a spry energy that belied her 75 years.